Four tables, on left, at the BLT Bar & Grill are supposed to be marked for public use. It was supposed to be a mutually beneficial trade: Developers of the new W Hotel at 123 Washington St. would get to construct a taller building, and in return the community would get a public plaza in an area with limited open space. But just months after the long-anticipated Gwathmey Plaza opened at Washington and Carlisle streets, questions are being raised over what the neighborhood really got out of the deal, which gave the developer nearly 60,000 additional square feet. “This public space was proposed to us as an amenity for the community,” CB1 member and nearby resident Pat Moore told representatives of the hotel’s developer, the Moinian Group, at a meeting of CB1’s Financial District Committee last week. “It is open to the public, but none of us can tell that it is open to the public.” Plaza users complain that the space appears less like a public plaza, and more like private outdoor seating for BLT Bar & Grill, a restaurant on the ground floor of the hotel and operators of a food kiosk. The Moinian Group, its land use lawyer, and the plaza’s landscape architect did not respond to a request for comment. But representatives of the Moinian Group told the Financial District Committee that the issues seemed to be largely a matter of “messaging” and something they would tackle. The plaza, which fronts both Washington and Carlisle streets, is divided into two sections. The half that is closest to Washington Street features a few wooden benches and an outdoor dining cafe for the restaurant. Further toward Greenwich Street, the plaza is raised, with tables, benches and the food kiosk. 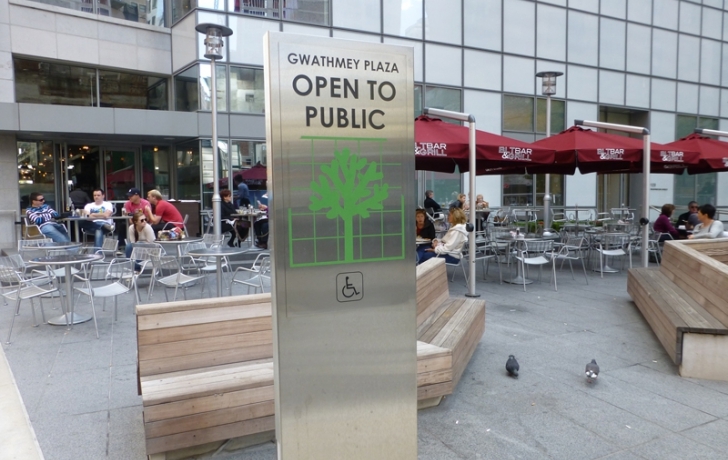 Although the benches along the street seem well-used by passersby, few visitors or area workers seem aware that the tables on the platform are for the public and not just seating for the burger kiosk. There is a sign on either end of the plaza stating the space is for public use, but none within the seating areas. “It doesn’t strike you as jumping out and saying, ‘public space this way,’” said Renee Campion, who was sitting at a table on the raised platform and eating a burger from the kiosk. Near Campion, two tourists from Pittsburgh had plopped down at a table without purchasing food, but seemed similarly confused. “It seems like the seats are for the burger place,” said Katie, a tourist who declined to give her last name. “I was just hoping we wouldn’t get chased out.” Things are even more confusing at the cafe space abutting the BLT Bar & Grill. In order to comply with city code, which limits how much of a public plaza can be monopolized by a restaurant cafe, the four tables nearest Washington must be public tables permanently affixed to the sidewalk, and differentiated from the cafe with a dashed line on the ground. Until recently, all the tables at the cafe were close together, covered with BLT umbrellas. At lunchtime they had place settings. There is no line on the ground, and the tables near Washington Street are the same moveable tables used by the rest of the cafe. At the Community Board meeting, a lawyer for the Moinian Group assured Moore that despite the lack of signage, the four tables at the cafe near Washington were for public use only. But that memo had yet to be passed along to the restaurant operator a few days later, when a restaurant hostess told the Trib that none of the tables were for public use. On the phone, another restaurant employee told the Trib that the tables were for restaurant service during the day, but that members of the public could ask to speak to a manager and be put on a waiting list if they wanted to use a table. The day after the Trib made inquiries about the seating, a reporter stopped by the plaza and was shown the four tables reserved for the public. Asked when the policy began, the waiter said, "Today." “It was originally part of the approved plans to have four tables for the public, but obviously people were getting confused as to which of those tables were for the public,” the restaurant’s spokeswoman told the Trib. “Which is why we are making a clear definition now so that it doesn’t confuse anyone.” The restaurant does not currently plan to place signs on the tables indicating they are for public use, the spokeswoman said. “We are just separating them out a little bit further,” she said. Representatives of the plaza’s owner are expected to return to CB1’s Financial District Committee next month.